These pickles are so much better tasting then the kind you buy in a jar. Fresh from the stove and chilled in the refrigerator to your table for your summer evening barbeque. Prep time does not include chill time. Combine cucumbers, onion, vinegar, sugar, salt, mustard seeds, dry mustard, turmeric, crushed red pepper, and celery seeds; heat to boiling over high heat, stirring occasionally. Boil 1 minute, stirring frequently. Pour cucumber mixture into a large bowl; cool to room temperature, stirring occasionally. Cover and chill overnight before serving. You can spoon cooled cucumbers and their liquid into jars with tight-fitting lids and refrigerate up to 4 weeks. I usually will make at least 4 times this amount. Help I made this like it said only left out the tummeric could not find. could not eat the pickels what did I do wrong ??? This was my first try at making pickles, and this recipe is a winner! They have more kick to them than most store-bought bread and butter pickles, which is a nice change. I will keep coming back to this recipe. 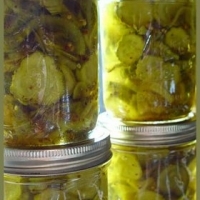 My second son and I love pickled cucumber, but I have never tried to make them. Of the stuff off the shelf we had a Polish pickle we loved but it is no longer available. Can I add a sprinkle of dill - or is that a different recipe and do I have to use a different process if I want to store for a longer period. I made bread and butter pickles, yesterday but I did the water bath ones so I can store them. Your recipe sounds great! We love the B&B pickles around my house. Like lanacountry's recipes? Never miss an upload!